Lynchburg-Clay’s Chelsea Hart attempts a layup over a Southeastern defender on Thursday at Lynchburg-Clay High School. Lady Mustang Peyton Scott finishes the fast break with a layup on Thursday at Lynchburg-Clay High School where the Lady Mustangs battles the Lady Panthers of Southeastern. 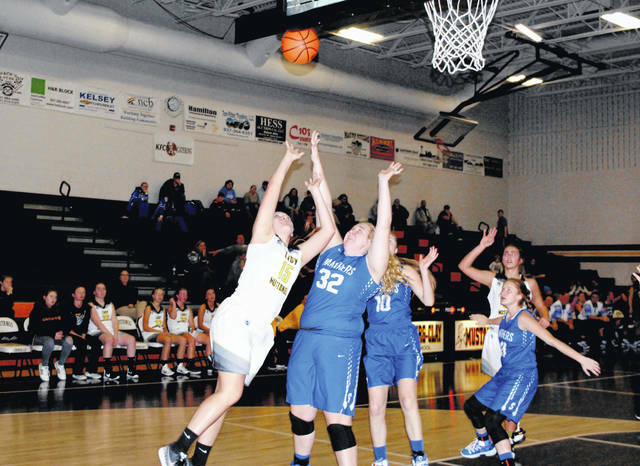 DODSONVILLE — The Lynchburg-Clay Lady Mustangs improved to 5-0 this season with a convincing 62-32 win over the Southeastern Lady Panthers on Thursday at Lynchburg-Clay High School in non-league play. The first quarter of play was tight as the Lady Panthers sent two and three defenders at Lynchburg-Clay leading scorer Peyton Scott but were unable to stop the other Lady Mustangs as they poured in 19 points in the quarter while allowing Southeastern to put up 14 of their own. All six players that scored for the Lady Mustangs had at least six points and five of them recorded totals of eight or more ato contribute to the win for Lynchburg. “We got kids almost scoring in double digits across the board, we really stepped up on the offensive end to pick that up,” said Lewis. The second quarter was more of the same for both teams and they were tied at 10 points apiece until the final minute when Scott and Zoe Fittro hit back to back three point shots to give the Lady Mustangs an 11 point lead at halftime 35-24. The third quarter is when Lynchburg-Clay really found its groove defensively as they held the Lady Panthers to just two points while scoring 14 of their own to extend their lead to 23 after three quarters of play. Scott got things rolling with back to back steals and fast break finishes and she scored 7 points in the period to lead the Lady Mustangs and Hart added four points as Lynchburg pulled away. “Defensively, that is going to kind of be our trademark for the year. We held the other team to two points in the third quarter. I am really happy with our defensive effort,” said Lewis. The fourth quarter was more of the same for the Lady Mustangs as they spread the ball around with five players recording at least one bucket in the final frame to ice the win for Lynchburg-Clay. “Peyton draws a lot of attention, when teams key on her and we can step up and hit shots it is really going to help us out as a team overall. I think tonight a lot of our offense came from our defense and that right there is going to be the biggest thing for us,” Lewis said. The Lady Mustangs will be in action agian next Thursday, December 13, when they host the Peebles Lady Indians in a Southern Hills Athletic Conference small school division matchup.